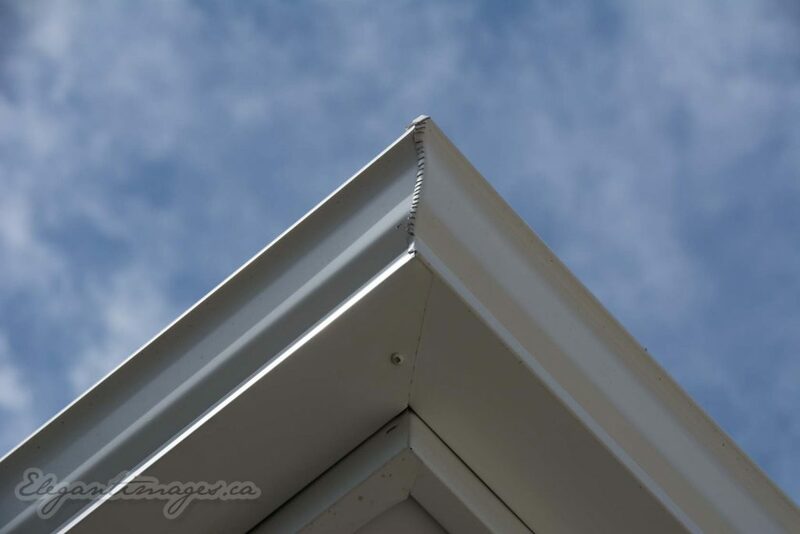 Eavestroughs also known simply as trough or gutter, is an integral part of your home’s rain management system. You want to get the rain that falls on your roof away from your foundation or deck as quick as possible. We do this by strategically placing downspouts in places that will allow the water to drain to areas that fall away from the house. We use a gutter machine to extrude your Eavestrough on site so we can get the exact length and properly place the downspouts in locations that divert rainwater away from your foundation. We use hidden hangers to attach your gutter to your fascia. We also put a slope on your eavestrough to send the water to the downspouts. We hand miter inside and outside corners as opposed to the miter corners that you can buy that just go over top of the corner. We then caulk the corners with caulking for a leakfree corner. So if you have been hit with hail or you are doing a new build, or your gutters are just old and falling apart, give us a call for your free no obligation Quote. We service North Calgary to Red Deer and all the little towns between.